I'm wondering why Android is still lagging. Seems like the butter project won't make it any better. My Lumia hasn't lagged at all even there's only one core inside it. I'd like to change back to Android because there's more great apps for Android than WP. But still, I prefer lag-free UI (WP) over great apps (Android), and I'm going to buy Lumia 920 as my next phone. iban, 10 Sep 2012ha ha ha very funny JB upgrade.. i dont know what Goggle strategy here.. Looks like they're ju... moreBTW, what are the new features in iOS which were not there in GB/ICS? Another successful story. Amazing device plus amazing OS. iban, 10 Sep 2012ha ha ha very funny JB upgrade.. i dont know what Goggle strategy here.. Looks like they're ju... morea lot of thnigs are new, but the best is the ui and higher frame rate, new graphic apis in games and smooth lag free os! ha ha ha very funny JB upgrade.. i dont know what Goggle strategy here.. Looks like they're just announcing JB just to show they have something since they know iOS6 is upcoming and WP8.. dont see anything new from ICS..
was shocked to see the other day, that even a quad core phone like SIII can hang and lag!!! wats the use of the quad core thing then!! also i found that da width of the screen has been reduced as compared to S2, dats really sad!! AnonD-36731, 09 Sep 2012If Google Now is anything like Google Search, Google Maps and Google Navigation on Android the... moreYeah, across the board it's a mixed experience for me. Web serches vary between sometimes giving me local and sometimes US. Maps & Navigation consistently gives me local - but you have to have your locations settings active for that (wireless networks, not GPS). You would expect that Google Now improves on this - will have to wait and see. For the comment that Google Now only works in english - incorrect. It came out working in several languages, and there was a GSMA news item not long ago talking about how they've added another 14 languages and soon to add more. Fade., 09 Sep 2012And the battery? All they wrote about was the ui and didn't tell anything about what it does t... moreYou can't really judge this until the final version is out. Are there any Nexus users out there who have upgraded to JB that can shed some light? what wow, 09 Sep 2012Far less ? how much is that ? 1 less ms ? 10 ms ? Lag is a thing of the past with android with... moreLag encompasses several things: speed of response, speed of execution, but mostly it's about screen freeze and stutters. The last and the first are really about the UI experience. Android has significantly improved the speed of execution (eg App launching, web browsing), generally surpasses iOS and WP. However speed of response is still inconsistent (from virtually instantaneous to 'earth to phone are you there?') and freeze/stutters/icon re-rendering still remain an issue (albeit improved). It's here that iOS and WP are still far more consistent. An App, messaging, contacts, etc... generally take the same time that it does to launch each time. Not saying they do it faster (they usually don't), but they do it at the same speed almost every time. So for a user the phones give you the feeling of consistent, snooth experience. JB goes a very long way to address this and does fix most of it, but not yet all. Some of the core programming needs an overhaul to streamline it (look at some of the Android lite versions out there). But mainly the manufacturer's launchers add alot to the problem. Touchwiz is the worst for this, Sony & HTC probably the better - though Motorola may be about to change that. Anonymous, 09 Sep 2012Flash will be missed if you like desktop style web browsing. Html5 is still far behind in many... moreYes - very true. HTML5 is a new standard & web programming code. So until web developers start using it more and more, Flash content will be around for a while. iOS does not use Flash and those users seem to manage OK. Anyway, if you have Flash installed now you will still have it when you upgrade to 4.1.1 - for upgrades after that it doesn't look likely. Not sure about how much Google Now can launch. It has been integrated into Android far deeper than before. I know it can set Alarms, calendar appointments, take memos, send texts, play music, launch maps and navigation - so it can launch some apps. Beyond that I don't know. I hope it can launch more because that is a feature I too like about S Voice. Regardless, I will be upgrading as I most want the smoother, more consistent UI experience it offers. on galaxy nexus the graphics performance (nenamark2 score) is higher than ics with jelly bean. but on galaxy s3 it's reduced. does anyone explain this? AnonD-70501, 08 Sep 2012first of all thanks for your reply i do really apreciate your answers secondly you say tha... moreyou can still download the flash apk! rcl4444, 08 Sep 2012True. However the have far less lag, however stats show they have slightly more app crashes. Far less ? how much is that ? 1 less ms ? 10 ms ? 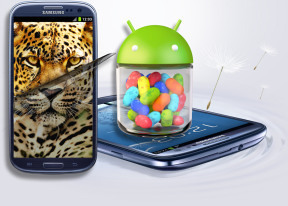 Lag is a thing of the past with android with the arrival of Jelly Bean. I Still Like Android Ice Cream Sandwich, Because It Does Not Loose Any Features Behind Its Older Versions. Where The New Release Loose The Some Features Of Older Version Of Android Mobile OS. You Can Also Buy This Phone But Still You Have To Search Basic Apps On The Web. I Suggest To Buy This Phone If You Are Happy With Only Performances Of Smart Phones. Not With The Size Shapes. And the battery? All they wrote about was the ui and didn't tell anything about what it does to the battery in general. So is JB better in general to all Android devices that ICS and if so, By how much? AnonD-64016, 09 Sep 2012Yes I agree, in my country Bangladesh I have not much use of those software like google maps. ... moreYep it's bad isn't it. I have just travelled 4000km trip around my country. I used a map book after Google Navigation was taking me hours longer and costing me more petrol. Some trips I did in 2/3 the distance and time. Almost all Google Navigation trips were 10-15% longer. So much for being free. If you add up the extra fuel it is the most expensive navigation software ever in the history of our planet. Google Navigation has a fetish for designated highways. That is probably faster in the USA but in my country a 100 kmph is a 100 kmph road. A have one example where Google navigation always try to make a 5km trip into a 10km trip by sending me to a highway. The roads are all the same speed limit. AnonD-36731, 09 Sep 2012If Google Now is anything like Google Search, Google Maps and Google Navigation on Android the... moreYes I agree, in my country Bangladesh I have not much use of those software like google maps. And typing my country everytime is surely boring.